I played Tint Pop and it looks and feel great ! You managed to get a concept that learns in seconds, and looks quite fresh and original. Good move ! 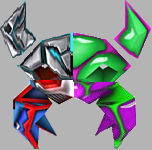 I've got a question as a Stencyl beginner: what kind of object/technique did you use to have those "vector" circular shapes moving around the player's pawn ? Another question: ware you happy with the financiall result of this game ?